Identification: Scott and Crossman (1973); Page and Burr (1991); Jenkins and Burkhead (1994). Native Range: Europe, northern Africa, and western Asia (Page and Burr 1991). Table 1. States with nonindigenous occurrences, the earliest and latest observations in each state, and the tally and names of HUCs with observations†. Names and dates are hyperlinked to their relevant specimen records. The list of references for all nonindigenous occurrences of Salmo trutta are found here. Status: Natural reproduction is low or nonexistent in most states, as such, many states maintain Brown Trout populations by periodic stocking. Rinne (1995) listed this species as established in Arizona, but the species may not be reproducing in open waters; Rinne apparently used the term 'established' for species that maintain long-term populations through continual or periodic stockings. Courtenay et al. (1984) indicated that introductions failed to establish populations in Florida, Kansas, Ohio, and Oklahoma. Impact of Introduction: Brown Trout have been implicated in reducing native fish populations (especially other salmonids) through predation, displacement, and food competition (Taylor et al. 1984). Many studies have been conducted looking at the effects of Brown Trout on Brook Trout Salvelinus fontinalis including Nyman (1970), Fausch and White (1981), Waters (1983), Fausch and White (1986), and DeWald and Wilzbach (1992), to name a few. Taylor et al. (1984) list a number of papers citing the effects of Brown Trout on native fishes. Fausch and White (1981) stated adult Brown Trout displaced adult native Brook Trout from the best habitats in a Michigan stream, and in the northeast in general. Brook Trout are also more susceptible to angling and predation. Conversely, juvenile Brook Trout are dominant over juvenile Brown Trout of the same size in an artificial stream (Fausch and White 1986). The competitive advantage of the two species may change with size, age, temperature, stream size, or environmental adaptations of different populations (Fausch and White 1986). Wagner et al. (2013) used two-species occupancy models to examine the distribution of Brown and Brook Trout in Pennsylvania streams, and found that predicted occurrence of Brook Trout was lower in the presence of Brown Trout across a wide range of landscape habitat characteristics. McKenna et al. (2013) used modeling, ordination, and simulations and found that stocking intensity of Brown Trout into Brook Trout habitat was a major factor in Brook Trout abundance, moreso than habitat differences or interspecific interactions. Houde et al. (2015) found that juvenile Brown Trout reduced the survival and growth of juvenile Atlantic Salmon (Salmo salar) from three populations in artificial stream trials. Although it rarely occurs, the Brown Trout is one of the few foreign species able to hybridize with natives (e.g., S. fontinalis) (Brown 1966; Taylor et al. 1984). In California, competition and predation from Brown Trout may have contributed to the decline of the Dolly Varden S. malma in the McCloud River (Moyle 1976), and of the Golden Trout Oncorhynchus aguabonita in the Kern River (Krueger and May 1991; Courtenay and Williams 1992). Brown Trout may have also depleted the Modoc Sucker Catostomus microps, an endangered species, in Rush Creek, Modoc County (Moyle and Marciochi 1975). Brown Trout have commonly replaced Cutthroat Trout O. clarkii in large rivers (Behnke 1992). McAffee (1966) specifically lists Lahontan cutthroats O. c. henshawi as being replaced by Brown Trout. Introduced Brown Trout, and other trout species, were likely responsible for the near-extinction of Lahontan cutthroat in Lake Tahoe in the 1940s (McAffee 1966). 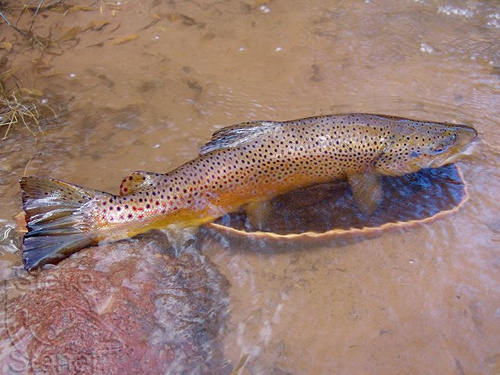 Because of their predatory nature, Brown Trout were introduced into Flaming Gorge Reservoir to reduce populations of the Utah Chub Gila atraria (Teuscher and Luecke 1996). Competition with and predation by nonnative species (i.e., Catostomus sp., Creek Chub Semotilus atromaculatus, Redside Shiner Richardsonius balteatus, Burbot Lota lota, Brown Trout Salmo trutta, and Lake Trout Salvelinus namaycush) limit populations of the rare Bluehead Sucker Catostomus discobolus (Wyoming Game and Fish Department 2010). Brown Trout occupy similar habitat types as, and predate upon, Roundtail Chub Gila robusta (a species of conservation concern) in Wyoming lakes (Laske et al. 2012). Nonnative predators, including Brown Trout, have been shown to reduce the abundance and diversity of native prey species in several Pacific Northwest rivers (Hughes and Herlihy 2012). Remarks: The state of California has attempted to eradicate Brown Trout in some areas in order to preserve native Golden Trout O. aguabonita (Taylor et al. 1984; Moyle, personal communication). Tyus et al. (1982) mapped the distribution of the Brown Trout in the upper Colorado basin. MacCrimmon and Marshall (1968) and MacCrimmon et al. (1970) summarized information on worldwide distribution and introductions. Álvarez, D., and E. Garcia-Vasquez. 2011. Maintenance of asymmetric hybridization between Atlantic salmon (Salmo salar) and brown trout (Salmo trutta) via postzygotic barriers and paternal effects. Canadian Journal of Fisheries and Aquatic Sciences 68(4):593-602. Bailey, J.R., and J.A. Oliver. 1939. The Fishes of the Connecticut watershed. Pages 150-189 in H.E. Warfel, ed.. Biological survey of the Connecticut watershed. Survey Report No. 4. New Hampshire Fish and Game Commission, Concord, NH. Bean, T.H. 1892b. The fishes of Pennsylvania, with descriptions of the species and notes on their common names, distribution, habits, reproduction, rate of growth and mode of capture. Report of the State Commissioners of Fisheries for the years 1889-90-91. Edwin K. Meyers, State Printer, Harrisburg, PA.
Behnke, R.J., and R.M. Wetzel. 1960. A preliminary list of the fishes found in the fresh waters of Connecticut. Copeia 1960(2):141-143. Bence, J.R., and K.D. Smith. 1999. An overview of recreational fisheries of the Great Lakes. Pages 259-306 in Taylor, W.W., and C.P. Ferreri, eds. Great Lakes fisheries policy and management: a binational perspective. Michigan State University Press. East Lansing, MI. Boogaard, M.A., T.D. Bills, and D.A. Johnson. 2003. Acute toxicity of TFM and a TFM/niclosamide mixture to selected species of fish, including lake sturgeon (Acipenser fulvescens) and Mudpuppies (Necturus maculosus), in Laboratory and Field Exposures. Journal of Great Lakes Research 29(Supplement 1):529-541. Brock, V.E. 1960. The introduction of aquatic animals into Hawaiian waters. Internationale Revue der gesamten Hydrobiologie 45(4):463-480. Brown, C.J.D. 1966. Natural hybrids of Salmo trutta and Salvelinus fontinalis. Copeia 1966(3):600-601. Brown, C.J.D., and A.C. Fox. 1966. Mosquito fish (Gambusia affinis) in a Montana pond. Copeia 1966(3):614-616. Burr, B.M. 1980. A distributional atlas of the fishes of Kentuky. Brimleyana 3:53-84. Burr, B.M., and L.M. Page. 1986. Zoogeography of fishes of the lower Ohio-upper Mississippi basin. Pages 287-324 in Hocutt, C.H., and E.O. Wiley, eds. The Zoogeography of North American Freshwater Fishes. John Wiley and Sons, New York, NY. Cardoza, J.E., G.S. Jones, T.W. French, and D.B. Halliwell. 1993. Exotic and translocated vertebrates of Massachusetts, 2nd edition. Fauna of Massachusetts Series 6. Massachusetts Division of Fisheries and Wildlife, Publication 17223-110-200-11/93-C.R, Westborough, MA. Clay, W.M. 1962. Aquatic-life resources of the Ohio River. Ohio River Valley Water Sanitation Commission, Cincinnati, OH. Courtenay, W.R., Jr., D.A. Hensley, J.N. Taylor, and J.A. McCann. 1984. Distribution of exotic fishes in the continental United States. Pages 41-77 in Courtenay, W.R., Jr., and J.R. Stauffer, Jr., eds. Distribution, biology and management of exotic fishes. Johns Hopkins University Press, Baltimore, MD. Courtenay, W.R., Jr., and J.D. Williams. 1992. Dispersal of exotic species from aquaculture sources, with emphasis on freshwater fishes. Pages 49-81 in Rosenfield, A., and R. Mann, eds. Dispersal of living organisms into aquatic ecosystems. Maryland Sea Grant Publication, College Park, MD. Cross, F.B., R.L. Mayden, and J.D. Stewart. 1986. Fishes in the western Mississippi drainage. Pages 363-412 in Hocutt, C.H., and E.O. Wiley, eds. The zoogeography of North American freshwater fishes. John Wiley and Sons, New York, NY. Cross, F.B., and J.T. Collins. 1995. Fishes in Kansas. University of Kansas Natural History Museum, Lawrence, KS. Crawford, S.S. 2001. Salmonine introductions to the Laurentian Great Lakes: a historical review and evaluation of ecological effects. Canadian Publication of Fisheries and Aquatic Sciences 132:1-205. DeWald, L., and M.A. Wilzbach. 1992. Interactions between native brook trout and hatchery brown trout: effects on habitat use, feeding, and growth. Transactions of the American Fisheries Society 121(3):287-296. Everhart, W.H. 1950. Fishes of Maine. Maine Department of Inland Fisheries and Wildlife. Augusta, ME. Fausch, K.D., and R.J. White. 1981. Competition between brook trout (Salvelinus fontinalis) and brown trout (Salmo trutta) for positions in a Michigan stream. Canadian Journal of Fisheries and Aquatic Sciences 38:1220-1227. Fowler, H.W. 1952. A list of the fishes of New Jersey, with off-shore species. Proceedings of the Academy of Natural Sciences of Philadelphia CIV:89-151. Grant, G.C. 2002. Spawning interactions between sympatric brown and brook trout may contribute to species replacement. Transactions of the American Fisheries Society 131(3):569-576. Hartley, S.E. 1996. High incidence of Atlantic salmon x brown trout hybrids in a Lake District stream. Journal of Fish Biology 48(1):151-154. Holton, G.D. 1990. A Field Guide to Montana Fishes. Montana Department of Fish, Wildlife and Parks, Helena, MT. 104 pp. Ikuta, K., Y. Suzuki, and S. Kitamura. 2003. Effects of low pH on the reproductive behavior of salmonid fishes. Fish Physiology and Biochemistry 28(1-4):407-410. Krueger, C.C., and B. May. 1991. Ecological and genetic effects of salmonid introductions in North America. Canadian Journal of Fisheries and Aquatic Science 48(Suppl. 1):66-77. Kuhne, E.R. 1939. A Guide to the Fishes of Tennessee and the Mid-South. Tennessee Department of Conservation, Nashville, TN. 124 pp. Lapin, W.J. - Dept. of Environmental Management, Division of Fish and Wildlife, West Kingson, Rhode Island. Response to USGS/BRD-G nonindigenous questionnaire. 1992. Laske, S.M., F.J. Rahel, and W.A. Hubert. 2012. Differential interactions of two introduced piscivorous salmonids with a native cyprinid in lentic systems: implications for conservation of roundtail chub. Transactions of the American Fisheries Society 141(2):495-506. Lee, D.S., C.R. Gilbert, C.H. Hocutt, R.E. Jenkins, D.E. McAllister, and J.R. Stauffer, Jr. 1980 et seq. Atlas of North American freshwater fishes. North Carolina State Museum of Natural History, Raleigh, NC. (Cited as a work rather than as individual accounts in the interest of space). Lee, D.S., S.P. Platania, C.R. Gilbert, R. Franz, and A. Norden. 1981. A revised list of the freshwater fishes of Maryland and Delaware. Southeastern Fishes Council Proceedings 3(3):1-10. Ling, N. 2005. Rotenone--a review of its toxicity and use for fisheries management. New Zealand Department of Conservation, Wellington, New Zealand. Lintermans, M. and T. Raadik. 2003. Local eradication of trout from streams using rotenone: the Australian experience. Pages 95-111 in Managing invasive freshwater fish in New Zealand: Proceedings of a workshop hosted by the Department of Conservation, Hamilton, New Zealand. MacCrimmon, H.R., and T.L. Marshall. 1968. World distribution of brown trout, Salmo trutta. Journal Fisheries Research Board Canada 25(12):2527-2548. MacCrimmon, H.R., T.L. Marshall, and B.L. Gots. 1970. World distribution of brown trout, Salmo trutta: further observations. Journal Fisheries Research Board Canada 27(4):811-818. Marking, L.L. and T.D. Bills. 1985. Effects of contaminants on toxicity of the lampricides TFM and Bayer 73 to three species of fish. Journal of Great Lakes Research 11(2):171-178. Mather, F. 1889. Brown trout in America. Bulletin of the U.S. Fish Commission 7(1887):21-22. Matthews, M.A., W.R. Poole, C.E. Thompson, J. McKillen, A. Ferguson, K. Hindar, and K.F. Wheelan. 2000. Incidence of hybridization between Atlantic salmon, Salmo salar L., and brown trout, Salmo trutta L. in Ireland. Fisheries Management and Ecology 7(4):337-347. McAffee, W.R. 1966. Lahontan cutthroat trout. Pages 225-231 in A. Calhoun, editor. Inland Fisheries Management. California Department of Fish and Game. McKenna, J.E., Jr., M.T. Slattery, and K.M. Clifford. 2013. Broad-scale patterns of Brook Trout responses to introduced Brown Trout in New York. North American Journal of Fisheries Management 33(6):1221-1235. http://dx.doi.org/10.1080/02755947.2013.830998. Mettee, M.F., P.E. O'Neil, and J.M. Pierson. 1996. Fishes of Alabama and the Mobile Basin. Oxmoor House, Inc. Birmingham, AL. 820 pp. Moyle, P. – University of California, Davis, CA. Moyle, P.B., and A. Marciochi. 1975. Biology of the Modoc sucker, Catostomus microps (Pisces: Catostomidae) in northeastern California. Copeia 1975(3):556-560. National Park Service. 2011. Natural Resource Fact Sheet--Exotic Fish Management. National Park Service. North Dakota Game and Fish Department. 1994. Fishes of the Dakotas. Brochure. North Dakota Game and Fish Department, Bismark, ND. Nyman, O.L. 1970. Ecological interaction of brown trout (Salmo trutta) L., and brook trout (Salvelinus fontinalis) (Mitchill), in a stream. Canadian Field-Naturalist 84:343-350. Penaluna, B.E., I. Arismendi, and D. Soto. 2009. Evidence of interactive segregation between introduced trout and native fishes in Northern Patagonian rivers, Chile. Transactions of the American Fisheries Society 138:839-845. Pflieger, W.L. 1975. The Fishes of Missouri. Missouri Department of Conservation, Jefferson City, MO. 343 pp. Pflieger, W.L. 1997. The Fishes of Missouri. Missouri Department of Conservation, Jefferson City, MO. 372 pp. Pham, L., D. West, and G.P. Closs. 2013. Reintroduction of a native galaxiid (Galaxias fasciatus) following piscicide treatment in two streams: response and recovery of the fish population. Ecology of Freshwater Fish 22(3):361-373. Phillips, E.C., M.E. Washek, A.W. Hertel, and B.M. Niebel. 2003. The round goby (Neogobius melanostomus) in Pennsylvania tributary streams of Lake Erie. Journal of Great Lakes Research 29(1):34-40. Pigg, J. – State of Oklahoma Department of Environmental Quality, Oklahoma City. Powers, S.L., and P.A. Ceas. 2000. Ichthyofauna and biogeography of Russell Fork (Big Sandy River - Ohio River). Southeastern Fishes Council Proceedings. 41: 1-12. Rohde, F.C., R.G. Arndt, J.W. Foltz, and J.M. Quattro. 2009. Freshwater Fishes of South Carolina. University of South Carolina Press, Columbia, SC. 430 pp. Rohde, F.C., R.G. Arndt, D.G. Lindquist, and J.F. Parnell. 1994. Freshwater Fishes of the Carolinas, Virginia, Maryland, and Delaware. University of North Carolina Press, Chapel Hill, NC. 122 pp. Sajna, M. 1998. Outdoors: El Nino spurs early arrival of peregrines. Pittsburgh Post-Gazette. Smith, P.W. 1965. A preliminary annotated list of the lampreys and fishes of Illinois. Illinois Natural History Survey, Biological Notes 54. 12 pp. Starnes, W.C. and D.A. Etnier. 1986. Drainage evolution and fish biogeography of the Tennessee and Cumberland rivers drainage realm. Pages 325-362 in C.H. Hocutt, and E.O. Wiley, editors. The Zoogeography of North American Freshwater Fishes. John Wiley and Sons, New York, NY. Taylor, J.N., W.R. Courtenay, Jr., and J.A. McCann. 1984. Known impact of exotic fishes in the continental United States. Pages 322-373 in W. R. Courtenay, Jr., and J. R. Stauffer, editors. Distribution, biology, and management of exotic fish. Johns Hopkins Press, Baltimore, MD. Teuscher, D., and C. Luecke. 1996. Competition between kokanees and Utah chub in Flaming Gorge Reservoir, Utah-Wyoming. Transactions of the American Fisheries Society 125(4):505-511. Townsend, C.R. 1996. Invasion biology and ecological impacts of brown trout Salmo trutta in New Zealand. Biological Conservation 78:13-22. Trautman, M.B. 1957. The Fishes of Ohio. Ohio State University Press, Columbus. Underhill, J.C. 1986. The fish fauna of the Laurentian Great Lakes, the St. Lawrence Lowlands, Newfoundland and Labrador. Pages 105-136 in C.H. Hocutt, and E.O. Wiley, editors. The Zoogeography of North American Freshwater Fishes. John Wiley and Sons, New York, NY. U.S. Fish and Wildlife Service. 1993e. Lost River (Deltistes luxatus) and shortnose (Chamistes brevirostris) sucker recovery plan. U.S. Fish and Wildlife Service, Portland, OR. 108 pp. Vanicek, C.D., R.H. Kramer, and D.R. Franklin. 1970. Distribution of Green River fishes in Utah and Colorado following closure of Flaming Gorge Dam. The Southwestern Naturalist 14(3):297-315. Walker, P. 1993. A list of the endemic and introduced fishes of Colorado - March, 1993. Colorado Division of Wildlife, Aquatic Resources Unit. Unpublished manuscript. 16 pp. Washington Department of Fish and Wildlife. 1997. Washington fishing guide: Sportfish of Washington. (Available from http://www.wa.gov/wdfw/outreach/fishing/wfg97/wfgsport.htm. Page updated: May 7, 1997; page accessed October 31, 1997). Waters, T.F. 1983. Replacement of brook trout by brown trout over 15 years in a Minnesota stream: production and abundance. Transactions of the American Fisheries Society 112:137-146. Waters, T.F. 1999. Long-term trout production dynamics in Valley Creek, MN. Transactions of the American Fisheries Society 128(6):1151-1162. Young, K.A., J.B. Dunham, J.F. Stephenson, A. Terreau, A.F. Thailly, G. Gajardo, and C.G. de Leaniz. 2010. A trial of two trouts: comparing the impacts of rainbow and brown trout on a native galaxiid. Animal Conservation 13:399-410.